Last week, when Bud was feeling poorly we received exactly the thing to cheer him up - Thomas & Friends: Merry Christmas, Thomas! on two DVDs. The latest festive offering from Thomas the Tank Engine and his friends offers six festive episodes, alongside a special bonus disc - 'The Big Bang Surprise' featuring five more. 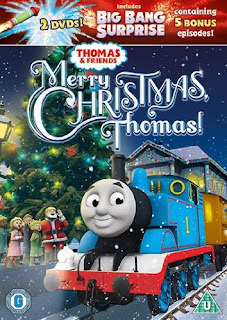 The Christmas DVD is really special, each story feature Christmas or snowfall on the Island of Sodor and Bud and I loved watching it and starting to feel festive. From hunting for Christmas trees on Misty Island, to Edward finding the perfect gift for Salty, from Percy being buried in snow, to the engines competing to find the perfect Christmas tree, it really is the perfect DVD to get all little Thomas fans excited for Christmas. We've watched it almost every day now so we know the episodes really well and it's lovely to watch the core themes of friendship, and being kind against a festive background. The Big Bang Surprise is a lovely bonus, as I think the Christmas DVD is well worth it alone. The five episodes work well as a collection. Our favourites were Sodor Surprise Day, which makes Bud laugh, a lot, and Happy Birthday Sir! which sees Thomas and his friends helping the Fat Controller to celebrate his birthday and features a new engine, Winston. We have thoroughly enjoyed Merry Christmas, Thomas! and would definitely recommend purchasing it in the run up to Christmas to help your little Thomas fans get excited (just in case they need any help with that) about the festive period. The DVD is available from all the usual retailers. Disclaimer: We received this DVD for the purpose of this review. All opinions are open and honest.